Our work has been continuing at Butser Ancient Farm, Hampshire with investigations being carried out gathering further evidence for our next meeting with the South Downs National Park Authority. The landscape around the Farm is rich in archaeology and cultural heritage, with many finds identified from the Bronze Age, Iron Age, Saxon and Roman periods. Meeting with the South Downs National Park’s officers to discuss the landscape-led approach raised several questions regarding the project’s initial ideas and ambitions. After much thought the team decided to trial drone photography late last summer. The dry weather did not help the investigation of earlier crop marking sightings however it proved helpful in other ways. 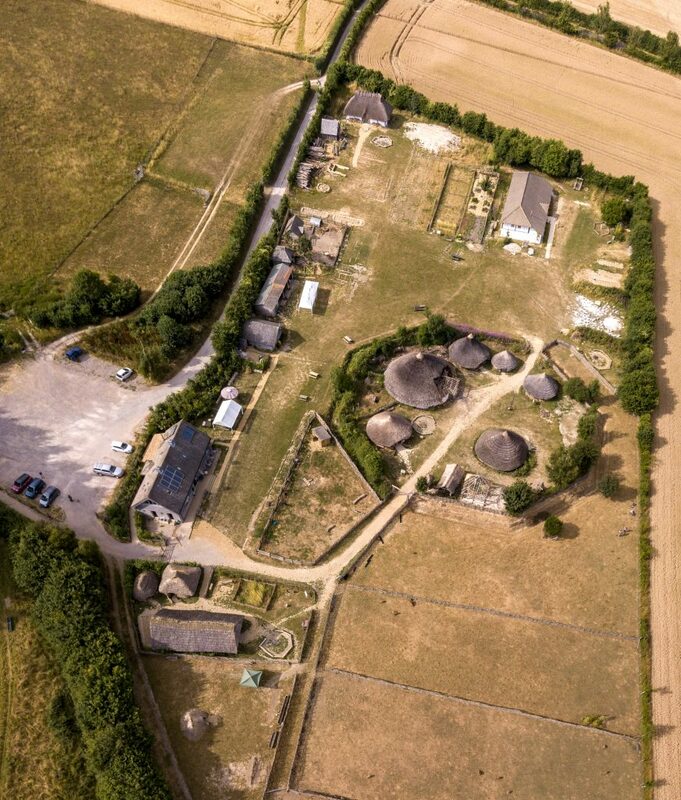 We were assisted by David Quick of Liss Archaeology who utilised his drone to film the Farm and surrounding landscape at 120m (400ft) above ground level to obtain clear images of the farm surrounded by its dry valleys, adding to our understanding of the area and influencing our discussions regarding the future expansion of facilities. From the air the undulating valleys, alterations in field boundaries and unusual features become very apparent, highlighting the total change that has occurred to the landscape character from the earlier field pattern shown on the 1870’s ordnance survey map and the qualities described in the Historic Landscape Character Assessment. Drone footage has not only helped us, as landscape architects to explain time-depth but will help those who have yet to visit the Farm to better understand the baseline information contained in the Landscape Visual Impact Appraisal and the wider issues being discussed. As a trial, the results of the drone footage we received were phenomenal…. not to mention generating a degree of motion sickness! I suspect that in future the use of drones as a tool to communicate and understand the landscape character from a different perspective may become much more common place. Looking up to look down! A Director of Butser Ancient Farm taking a walk through the landscape but keeping his feet firmly on the ground. 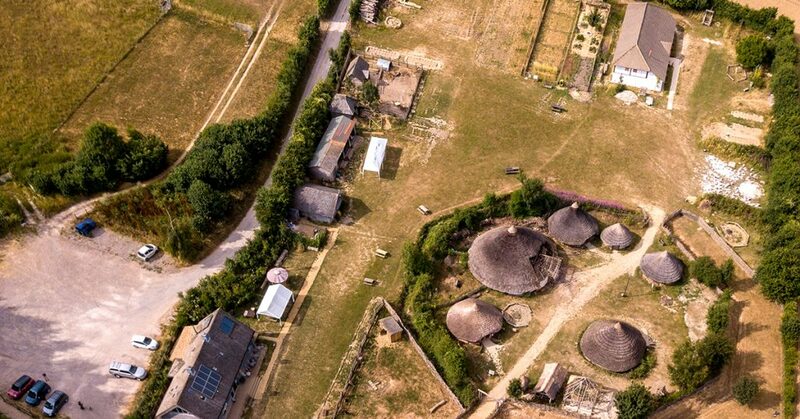 Butser Ancient Farm from the air taken using a small Mavic Pro drone made by the world’s leading drone manufacturer, a Chinese company DJI. 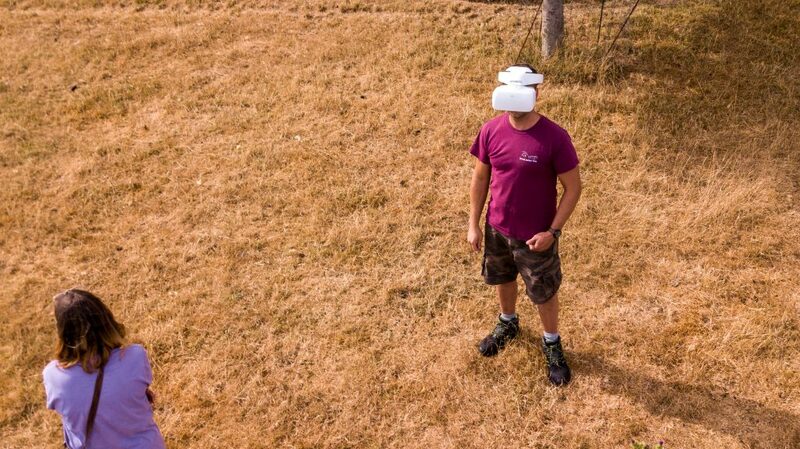 The drone was used together with DJI Goggles. These are worn by the customer or camera operator (not by the pilot) and give a live panoramic view in high definition (1920 x 1080 pixels for each eye) of what the drone is seeing. They also have movement tracking, i.e. can also be used to control the direction of the camera by the wearer’s head movements. The following information has been kindly provided by David Quick, Chairman of Liss Archaeology. David holds a Permit for Commercial Operations (PfCO) issued by the Civil Aviation Authority, has the necessary aviation risks liability insurance and undertook the flight at a time when the site was closed to the public. 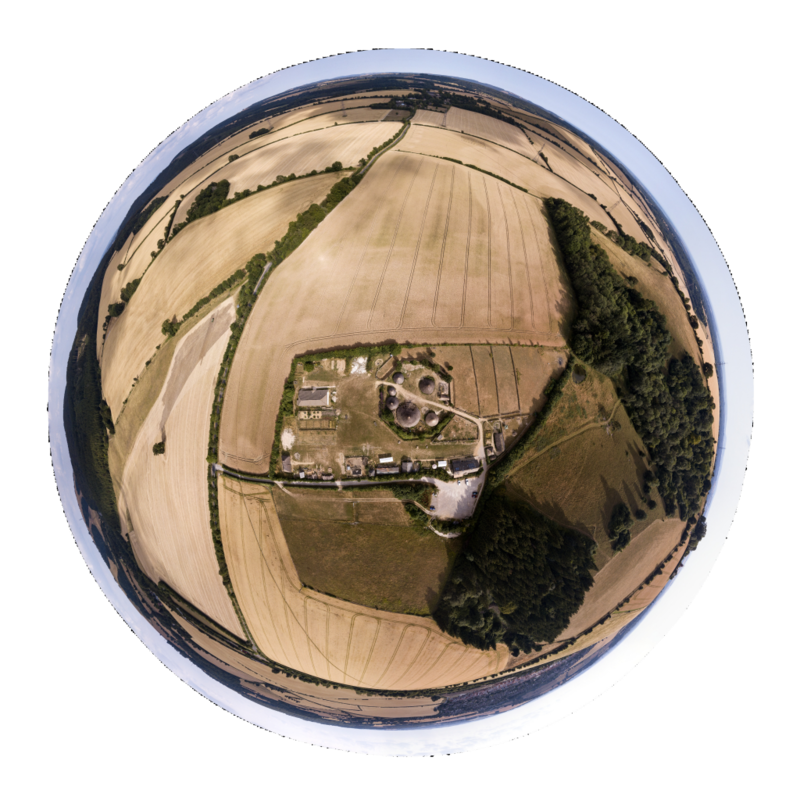 The images were taken at a height of 120m (400 ft) above ground level, which is the legal maximum height in the UK (to maintain separation from aircraft which do not normally fly below 500 feet – except helicopters). The small DJI Mavic Pro drone is the size of a paperback book when folded up is capable of taking either high resolution still photos (4000 x 3000 pixels) or 4k video with a gyro-stabilised Sony camera. It has various safety features such as collision avoidance and automatic return-to-home-and-land capability if, for example, the pilot becomes disabled or fails to land before the battery level gets too low. It can fly for approximately 30 minutes on one battery. Given the pace of progress in this technology, it has recently been superseded by the Mavic 2 which has even better flight time and all-round collision avoidance as well as a 20-megapixel Hasselblad camera. David also uses an earlier and much larger drone by the same company, called an Inspire. It is less convenient to carry around (a suitcase rather than a shoulder bag) and to set up but is better at resisting winds more than 30mph. Trench photos: The drone takes daily vertical imagery of our excavation trenches, instead of having to take such photos from scaffolding towers as previously. The necessary photos can be taken in under 2 minutes (during tea breaks), show very clearly the colour differences in soil in different parts of the trench, and avoid the cost and safety risks of scaffolding towers. Here is an example showing the contexts in one of the trenches at our Colemore dig site. a system which works on the principle of radar but uses light from a laser, useful for detecting archaeology when a site has tree or scrub cover or more generally for calculating the volume of quarries, coal tips, etc. others have thermal imaging cameras, useful for search and rescue or for checking the panels on solar farms. 3D modelling: The drone can easily be programmed quickly to fly in a circle around an object or in a grid pattern over it while taking photos. Specialised software such as Pix4D or 3DF Zephyr Aerial (for which we have a free licence from the manufacturer) can then create 3D virtual models of such objects – typically used for quickly creating models for architects or conservationists of large houses, castles, monuments, or even towns. An example can be seen below, and more here.